It’s been a long time coming. The SOPA blackout is finally here and a clear message is being sent to the US government. There are many places to learn about SOPA. I’ll provide links at the bottom. What I find fascinating are the blackout pages, which were spread virally. I’ll provide some SOPA blackout screenshots here on the blog. Others will appear on my Flickr page. Have you updated your Facebook privacy settings? No, go ahead and do it now. I’ll wait. I’ll wait, but the identity thieves and hackers aren’t waiting. They’re out there collecting all kinds of personal information about you. Consider all of the personal information that you post to message boards and profiles. With some time and effort, people can gather some pretty significant data on you. Add this to the stuff you’ve posted online about yourself in comments and Wall-to-Wall posts….and you’re looking at a LOT of personal information on Facebook alone. This is more stuff than some famous people have published about themselves. And at least they get the side benefit of being famous (and sometimes rich!). Let’s just remember that “mother’s maiden name” is sometimes a security question for financial institutions. As are offbeat questions about your personal life that, theoretically, only you should know. If you want to make it even more creepy, go to Google Maps or Google Earth. Type in your home address. If you’re looking at an aerial photo of your house, then everyone knows where you live. And if you post when you’re on vacation on your Facebook status, you may be telling everyone when your house will be vacant.They’ll even provide directions for burglars. So, yeah. Go update that Facebook profile and keep some of your personal life private. 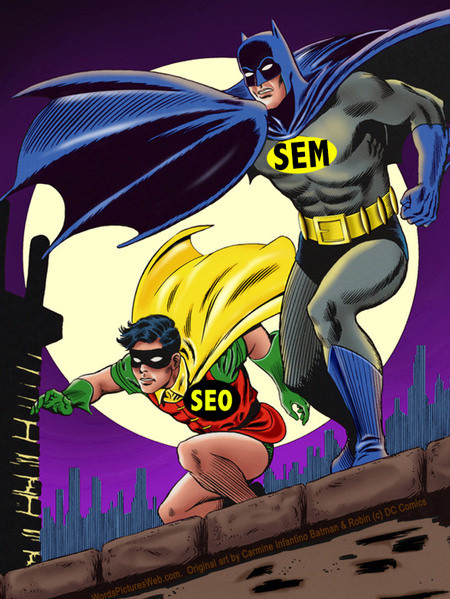 The Search landscape is once again changing. With Microsoft’s purchase of Yahoo, there seems to be a new challenge to Google, which currently holds a majority share of search traffic. In fact, Google is both #1 (through Google.com) and #2 (through YouTube, which is not typically thought of as a search engine). It’s always exciting to see new innovations and changes. To their credit, the folks at Google have not simply sat on their lead. They keep giving us search marketers new and interesting tools for attracting leads and running Search Engine Marketing (SEM) campaigns. Microsoft’s Bing search engine has been showing a lot of promise, and we’re already running campaigns there. MSN search always had some intriguing demographic targeting tools, but they never pulled enough traffic to see if the system would scale. As they join forces with Yahoo, it will be interesting to see how MicroHoo (that’s Microsoft + Yahoo to you) approaches services beyond keyword search. Let’s see some solid new ways to drive and measure relevant traffic from content, site, and video targeting. Microsoft and Yahoo have some solid resources and assets. It will be interesting to see if Yahoo can effectively pull properties like Flickr, Delicious, Yahoo Video, or even Avatars into Search. On Microsoft’s side, they have some interesting properties that could be part of Search, including Silverlight, X-Box, Zune, Healthvault, Money, Streets, and Windows Mobile. Let the (new) games begin! Most dedicated Mac users I know tend to use the iLife applications that come with a new Mac. While not particularly glamorous, these apps work well together. Apple’s integration strategy makes the whole suite hard to resist. But as the Mac market share increases, we see more companies developing new and interesting applications for OSX. Google just released a Mac desktop version of Picasa, which is designed to appeal to iPhoto users. Based on this video, Picasa for Mac has some interesting features, particularly the ability to sync your online galleries. I use Picasa to share pictures, so I’m likely to try the new Picasa for Mac. Picasa is functional, but not as good as Flickr for sharing pictures. But considering the fact that Flickr is owned by Yahoo, it may be time to explore other picture-sharing networks. Yahoo’s future is pretty hazy, and they are likely to get purchased by another media company. That means networks like Flickr could undergo some significant changes. Picasa may not be perfect, but knowing that it is backed by Google helps me have more confidence that my pictures will survive online. And the step to embrace the Mac platform just makes me plain ol’ happy. As we increasingly move to an Internet-centric society, we’re seeing all kinds of new and interesting careers spring up. Soon, we’ll see some interesting career opportunities for smart, adaptable workers. A few years ago, we saw the rise of professional bloggers and search engine marketing specialists. Right now, we’re seeing professionals developing mobile applications and social media widgets. In 2009, we’ll see the evolution of the Search Specialist. Now, these people are already out there in niche jobs (and they’ll probably be able to find this blog posting). But coming soon, we’ll probably see headhunters and HR departments looking for knowledge workers who can quickly and effectively mine the Net for super-specific information. It would be natural to expect this to go to someone with a library sciences degree, but I think Search Specialists will evolve from people who work within specific industries. I’ll give you an example. I worked as an editor at a small e-marketing agency specializing in pharmaceutical communications directed at healthcare professionals. On my team, I had an editor who was a wizard at uncovering information on the web. Sure, she was good at Google, but that’s a given. She also knew how to dig deeper and get information in other search engines, like Yahoo, Ask, and MSN (all of which give different results). She also knew how to search blogs, message boards, and news articles to dig up more information. This is going back a few years before the big YouTube and Twitter explosion. But a Search Specialist will be the kind of person who can quickly and effectively dig up, organize, and present highly focused data sources. In our case, this editor could dig up information, sort the gems from the junk, and generate an informed position on just about any topic you can imagine. Going forward, and it’s going to be important to access all kinds of information on the public Net, even the stuff that isn’t well tagged and indexed by Google. Blogs, videos, Flash interfaces, games, e-books, Twitters posts, social networks (including Facebook & MySpace), manuals, databases, closed communities, news archives, software, all contain valuable information. Some of this information is indexed, but most of it is not. Several industries already leverage search specialists, including patent and other legal businesses. In the future, other industries will seek people out who can mine and measure information from Net sources. Search Specialists will be needle-in-a-haystack researchers who defy traditional job roles. Some of them will be research specialists or editors or scientists or journalists or work from home entrepreneurs. In the beginning, they will be underpaid and under appreciated. But one day they will be valued and coveted knowledge workers who can extract stubborn data from nearly any source. In the right organization, they will be highly paid and highly promotable, especially as they research corporate strategies. If you like to search, discover, and organize, it’s probably a good time to start positioning yourself as a Search Specialist in your current career. Eventually, as the career landscape shifts, you’ll be prepared for a new career as a Search Specialist.